New York Mayor Michael R. Bloomberg, New York State Governor David Paterson, Brooklyn Borough President Marty Markowitz, Rapper and NETS investor Shawn "Jay-Z" Carter pose for a photo at the ceremonial groundbreaking for Barclays Center at Atlantic Yards on March 11, 2010 in New York City. Officials broke ground Thursday on a much-delayed 22-acre development project that will bring the Nation Basketball Association New Jersey Nets to Brooklyn. As protesters chanted and staged a mock funeral for the "soul" of Brooklyn, supporters enjoyed a lavish spread catered by developer Bruce Ratner. "Today is a great day for Brooklyn and for the soul of Brooklyn, which is very much alive," said Brooklyn Borough President Marty Markowitz, the biggest cheerleader of the Atlantic Yards project since it was announced in 2003. Markowitz joined Mayor Michael Bloomberg, Gov. David Paterson and hundreds of others at a ceremonial groundbreaking for the $4.9 billion Barclays Center which has been delayed by lawsuits filed by residents fighting the use of eminent domain. Officials broke ground for the new Brooklyn Nets stadium Thursday -- but not everybody in attendance was a fan. Forest City Ratner sold 20-year naming rights to British-based global financial services company Barclays PLC in 2007, and the arena will be called Barclays Center. When Ratner proposed Atlantic Yards before the economic downturn, celebrity architect Frank Gehry was going to transform downtown Brooklyn with apartment buildings bearing his trademark undulating shapes. But Gehry was fired because his designs were too expensive, and no new architect has been announced for the residential buildings. The latest renderings of the arena show a conventional dome, drawing criticism from opponents. Supporters say Atlantic Yards will provide jobs and economic development. "As the buildings rise on Atlantic Yards, the joblessness rate will fall right here in Brooklyn," Paterson said, claiming the project would create 16,000 construction jobs and 5,500 permanent jobs. The 18,000-seat arena is to open in 2012, and construction will begin on the first of 16 residential and office buildings in 2011. Last December, Ratner's Forest City Ratner Cos. finalized a deal to sell 80 percent of the Nets and 45 percent of the arena to Russian billionaire Mikhail Prokhorov. Prokhorov was not at the groundbreaking, but entertainer Jay-Z, an investor in the team, said, "We did it again, Brooklyn." 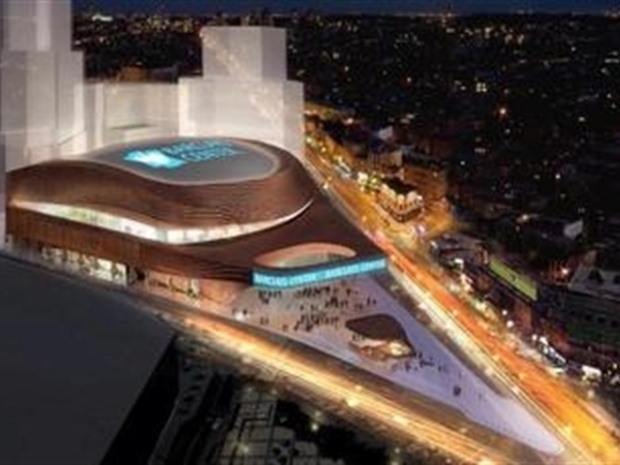 The project will also include the Barclays Center soccer stadium, part of a sports building boom in the New York metropolitan area. The officials spoke inside a tent at the groundbreaking site, while the protesters shouted and blew whistles outside. "What they're going to build is a money-losing arena, maybe one or two towers and acres and acres of parking," said Daniel Goldstein, founder of the group Develop Don't Destroy Brooklyn. His wife, Shabnam Merchant, stood Thursday in front of their home, which has been seized by the state to make way for the project, although they have yet to leave. She held her 16-month-old daughter and a sign that said: "You're celebrating? We live here." Supporters also say the project is a chance for Brooklyn to get a professional sports franchise for the first time since the Dodgers departed for Los Angeles after the 1957 season.